To ensure your understanding of the Five-Paragraph Model, outline each of the four essays in the packet of example five-paragraph essays (including the essay Professor Gernsbacher outlined in her lecture video). Outline each of the four essays (from the packet) in the way that Professor Gernsbacher outlined the example essay in her lecture video. Use this fillable PDF. First, download the unfilled PDF and save it on your own computer. Second, rename the unfilled PDF to be YourLastName_PSY-225_Gernsbacher_FiveParagraph_Fillable.pdf. In other words, add your last name to the beginning of the filename. Third, on your computer, open a PDF writer app, such as Preview, Adobe Reader, or the like. Be sure to open your PDF writer app before you open the unfilled PDF from your computer. Fourth, from within your PDF writer app, open the unfilled PDF, which you have already saved onto your computer and re-named. Fifth, using the PDF writer app, fill in the PDF. Sixth, save your now-filled-in PDF on your computer. Go to Unit 3: Assignment #1 and submit your filled-in PDF. The Unit 3: Assignment #1 link is an Assignment link, rather than a Discussion Board link, so it will look a bit different than the other submission links you’ve seen in this course so far. After submitting your assignment, check to make sure that your filled-in PDF is really filled-in (and isn’t empty). Choose two “Reasons/Arguments Prompt” quotes from page one of this list of quotes (page one provides a list of 20 quotes that are “Reasons/Arguments Prompts” for five-paragraph essays). Think of and then jot down (somewhere) a Reason A, a Reason B, and a Reason C in favor of or opposed to each of the two “Reasons/Arguments Prompts” quotes you have chosen. Choose two “Examples Prompt” quotes from page two of the list of quotes (page two provides a list of 20 quotes that are “Examples Prompts” for five-paragraph essays). Think of and then jot down (somewhere) an Example A, an Example B, and an Example C to support each of the two “Examples Prompts” quotes you have chosen. You have now chosen four quotes. For both the first and the second quotes, you have written down your Reason A, Reason B, and Reason C in favor of or opposed to each of those two quotes. For both the third and the fourth quotes, you have written down your Example A, Example B, and Example C to support to each of those two quotes. Check to make sure you have done all of this. a fourth Thesis Statement that incorporate your Example A, Example B, and Example C to support the second “Examples Prompt” quote you chose. To ensure your understanding of the Basic Recipe for Writing Paragraphs, outline three paragraphs using this fillable PDF, which you should first save to your own computer and then fill in. Refer back to Unit 3: Assignment #1, part d. for how to download, save, then open, and fill in a fillable PDF. For the three paragraphs you will outline, you can choose the other two paragraphs in Aims’s article that were not completely outlined in Professor Gernsbacher’s lecture video and one other paragraph from the packet of example five-paragraph essays. Although you won’t turn in this filled-in PDF, you should nonetheless be sure to do this step. Although these tips are for writing an essay during the Graduate Record Exam (GRE) test, the recommendations apply to the types of essays you write in college and that you are writing for this course. Pay specific attention to recommendation to avoid writing “I think” or “I believe,” along with the reason why you should avoid writing such terms in your essays. Now comes the time to put into action everything you’ve learned in the first three assignments of this Unit. Choose one of the two “Reasons/Arguments Prompts” quotes that you have been working on in this Unit and write an entire five-paragraph essay on that one Reasons/Arguments quote. your Conclusion Paragraph needs to restate your Thesis Statement and end with something witty or profound. Save your “Reasons/Arguments” essay as a PDF with the filename YourLastName_Reasons_Essay.pdf. Choose one of the two “Examples Prompts” quotes that you have been working on in this Unit and write an entire five-paragraph essay on that one Examples Prompt quote. Save your “Examples Prompts” essay as a PDF with the filename YourLastName_Examples_Essay.pdf. Go to the Unit 3: Assignment #3 Discussion Board and make a new post. Use that post to “Attach” your Reasons Essay PDF using the “Attach” tool. If you can’t remember how to “Attach” a file, review Unit 2: Assignment #5. Because the Discussion Board will allow only one file to be attached to each post, make a reply post to the post to which you attached your Reasons Essay post. Then, use your reply post to “Attach” your Examples Essay PDF. Learn when to use me, myself, and I correctly. Remember that you can adjust the speed on this YouTube (or any YouTube) by following these directions. 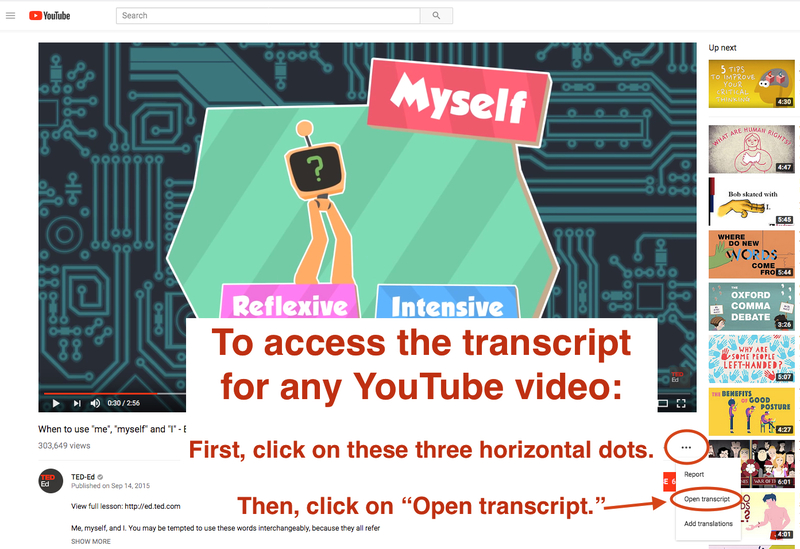 Remember that you can access a transcript of this YouTube (or any YouTube) by following these directions. Test yourself on the Me/I or Myself Quiz. Re-take the Quiz again (and again) until you earn a perfect score. find four songs in which EITHER “you and I” OR “you and me” is used incorrectly in their lyrics. four instances when someone has incorrectly used it’s. For all instances, be sure to write down or otherwise capture the sentence in which the usage of its or it’s occurred (and the URL where the instance occurred). Learn why it’s probably not a good idea to double space after a period. Think about whether you were taught to double space after a period. which grammar lesson provided in Pleated Jean’s video you were the least familiar with before watching the video. Write a five-paragraph essay that is a hypothetical cover letter for a job application (providing three reasons why you’re, hypothetically, the best person for the job or explaining, as examples, three hypothetical skills you’ll bring to the job). Write a five-paragraph essay that’s a hypothetical letter to your landlord explaining why you should receive your full deposit back. Write a five-paragraph essay dissuading a hypothetical student who didn’t receive the grade they hoped for from approaching the professor to ask if there’s any extra-credit they can do, after the class is over, to get the grade they hoped for. Take a screenshot of each your two essays (i.e., take two screenshots: one screenshot of one essay and another screenshot of the other essay; if you do not know how to take a screenshot, this website will help you). Go to Unit 3: Assignment #5 Discussion Board and make a new post in to which you embed the two images (screenshots) of the two essays you wrote for this Assignment. Remember to size each image correctly (no larger than 500 pixels as explained in the Course How To) and be sure to embed the image, not “attach” it. Read both essays that each of the other members of your small Chat Group posted in Unit 3: Assignment #3. If you are in a Chat Group with two other students, that means you will read four essays; if you are in a Chat Group with only one other student, that means you will read two essays. Learn how to provide peer review on your Chat Group members’ essays by reading the Peer Review Guidelines. Note that you will be answering 12 questions about each member’s essays. For this assignment, you will meet online with your small Chat Group at the time your Chat Group arranged for your one-hour text-based Chat. Prior to your Chat Group meeting online, all members of your Chat Group must have completed steps a. and b. of this Assignment. what to do if your Chat Group agrees on a date and time for your Chat, but one member of the Chat Group wants to reschedule or hasn’t joined the Chat within 15 minutes after the agreed upon time. Begin your one-hour Chat by introducing yourselves, including the name mnemonic that each Chat Group member provided in Unit 1: Assignment #2. Then, spend the remainder of your hour-long Chat with each Chat Group member providing peer review of the other Chat Group members’ essays. Before ending the Group Chat, your Chat Group might want to arrange the time for the Group Chat you will need to hold during the next Unit (Unit 4: Assignment #6). Nominate one member of your Chat Group (who participated in the Chat) to make a post on the Unit 3: Assignment #6 Discussion Board that summarizes your Group Chat in at least 200 words. Then, this member of the Chat Group needs to make a post on the Unit 3: Assignment #6 Discussion Board and attach the Chat transcript, saved as a webpage (i.e., .html), to that Discussion Board post. Nominate a third member of your Chat Group (who also participated in the Chat) to make another post on the Unit 3: Assignment #6 Discussion Board that states the name of your Chat Group, the names of the Chat Group members who participated the Chat, the date of your Chat, and the start and stop time of your Group Chat. Across the semester, be sure to trade off which member of your Chat Group does each task (writes and posts the summary; creates the transcript webpage and attaches it; posts the names, date, start/stop time) so that across the semester each member of the Chat Group carries an equal load. 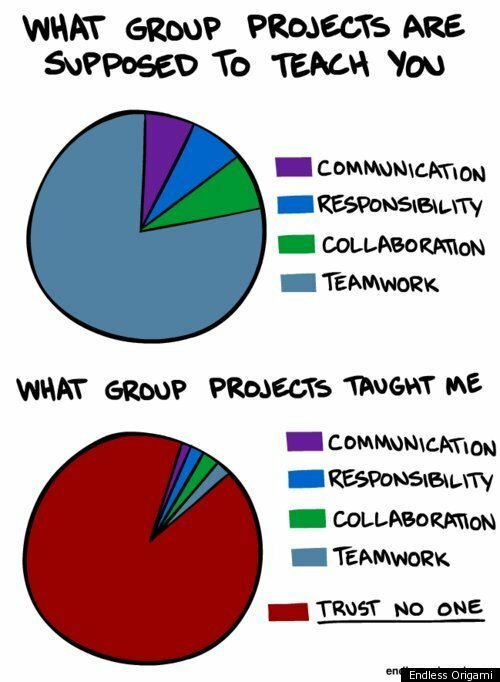 You don’t want to create a groupwork experience like the bottom chart of these charts. If only two persons participated in the Group Chat, then one of those two persons needs to do two of the above three tasks. All members of the Chat Group must record a typical Unit entry in your own Course Journal for Unit 3. Congratulations; you have finished Unit 3! Onward to Unit 4!